You contact us and we discuss your problem in detail before we recommend any analysis. Each request is different and it is important to understand what you really need for your question. When we have found the right analysis for you, we contact our partner for the details and you receive an offer from us. After confirmation of the offer, you send your samples and our partner will execute the agreed measurements. Normally within 3 - 4 weeks you receive a detailed report with the results from a business perspective. We discuss and explain the report with you to explain you with the full understanding of the details. Finally you receive the invoice for the provided services and initiate the payment. 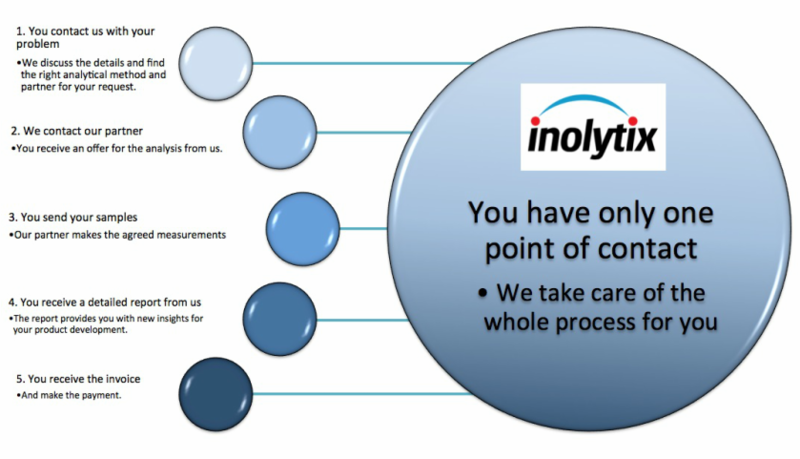 You only have one contact point and access to different analytical methods. You don't have to deal with different companies or processes. We take care of the whole process for you. And you receive detailed business oriented reports.